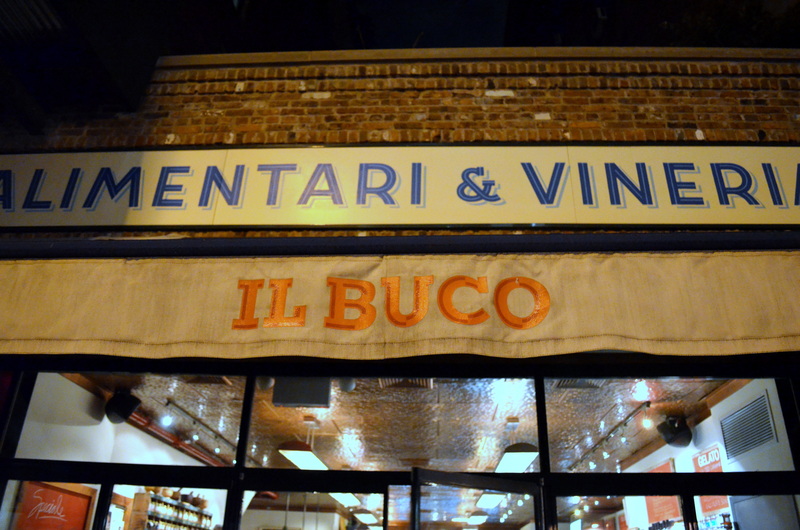 Il Buco Alimentari & Vineria, with its bright glassy entrance, felt warm and welcoming, the drool-inducing fragrance of a high-end deli giving you a big hug when you step through the door. 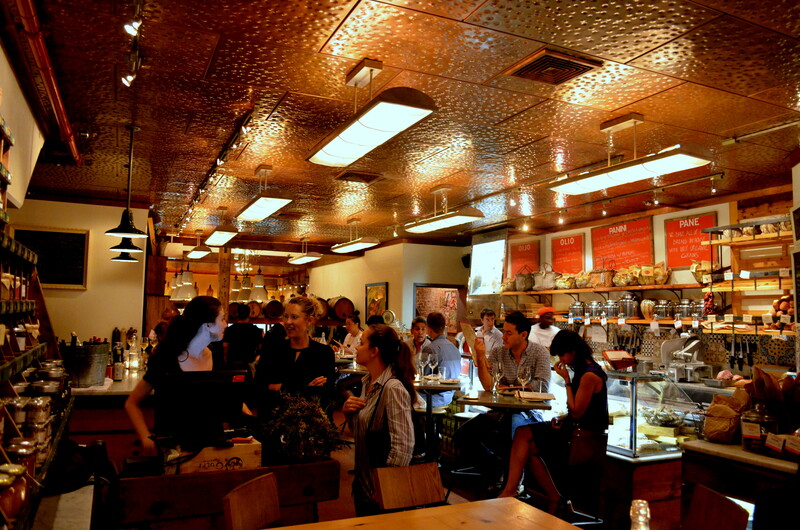 The buzz of dinner conversation is like another layer of aroma, convivial and inviting, settling in around us as we took our seats. We started with a small cheese plate, with a drizzle of honey on the side. The presentation I wish was looked a bit more generous, if only because compared to the big wheels and sturdy cases stacked behind the deli bar when you walk in, it looked a little meager. 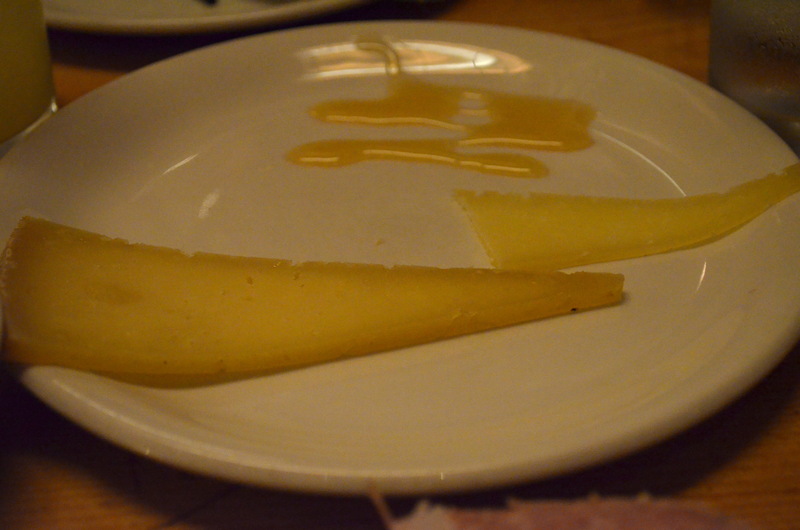 Great cheeses, though – stout, wholesome, sharp enough to stand out against the flowery honey. The salumi plate was superb, bits of peppery salami, prosciutto, what I recall to be coppa, and maybe one more cured meat that I don’t remember. 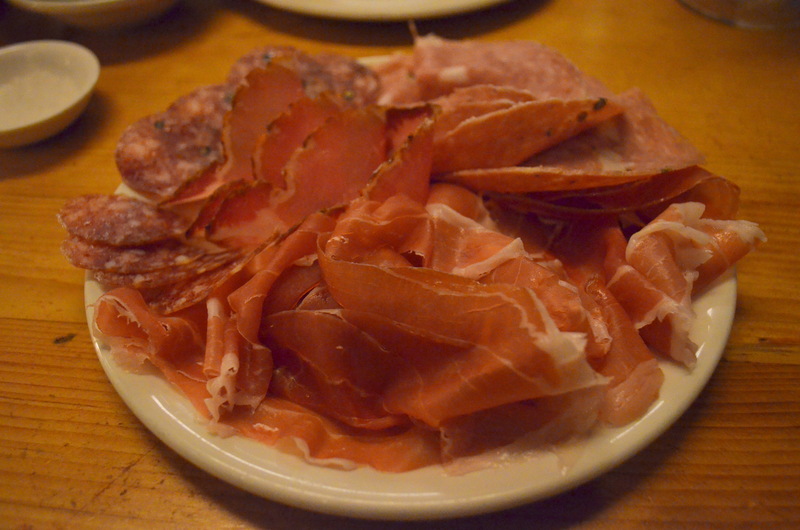 The fat on the prosciutto was tender and dissolved in a rush of salty, porky flavor. 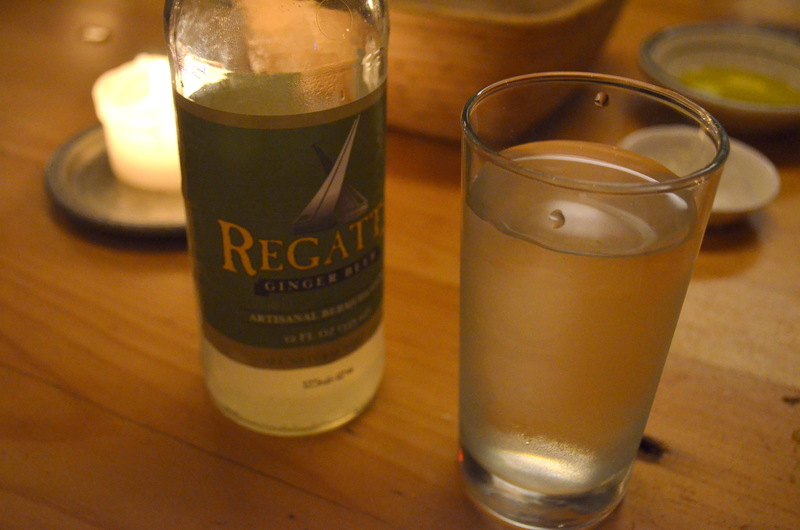 I had a cold refreshing ginger beer. 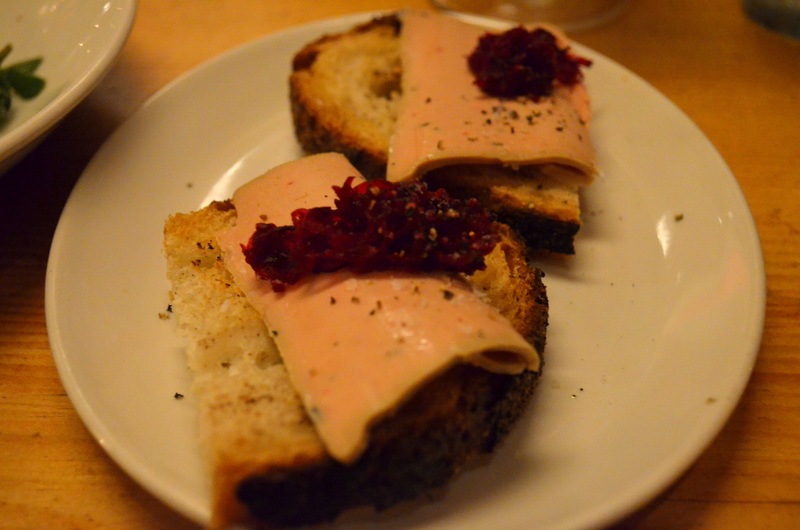 Shaved foie gras, grated beets, on grilled filone bread. 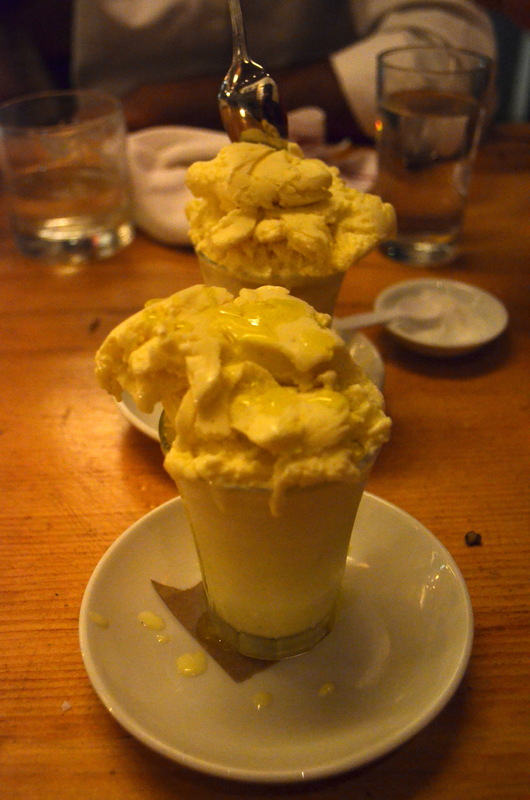 Ricotta with cucumber, lemon, herbs. 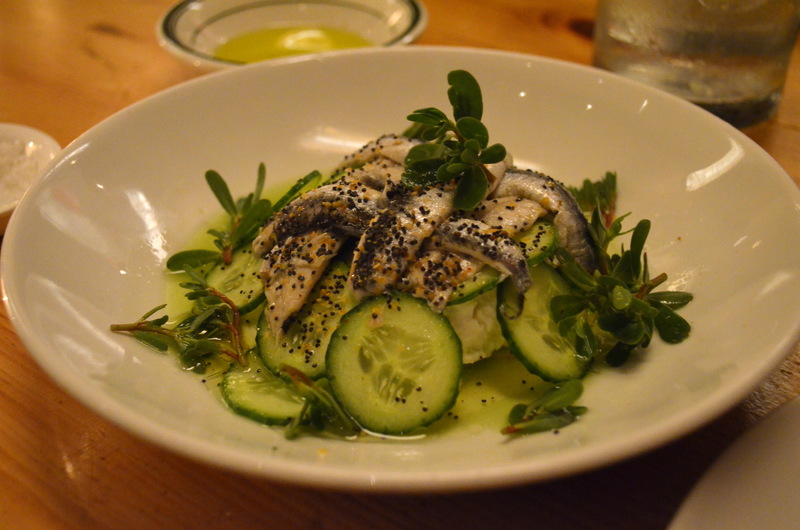 The freshness of this dish really shined, with meaty strips of briny anchovies sprinkled with black pepper. 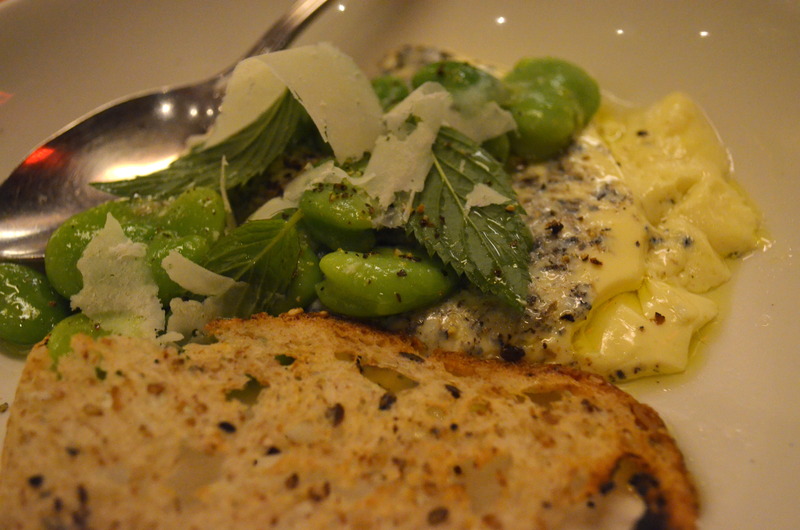 Uovo et tartufo bianco, Clawhammer (Farm) eggs, Battenkill (Valley) cream, and white truffles. The soft creaminess of the eggs was phenomenal. 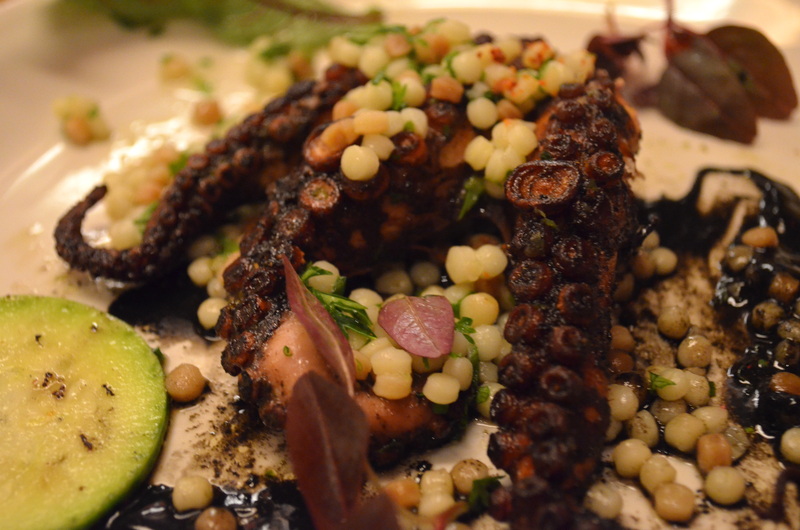 Pulpo à la plancha, seared octopus, heirloom squash, frigola, and black garlic. 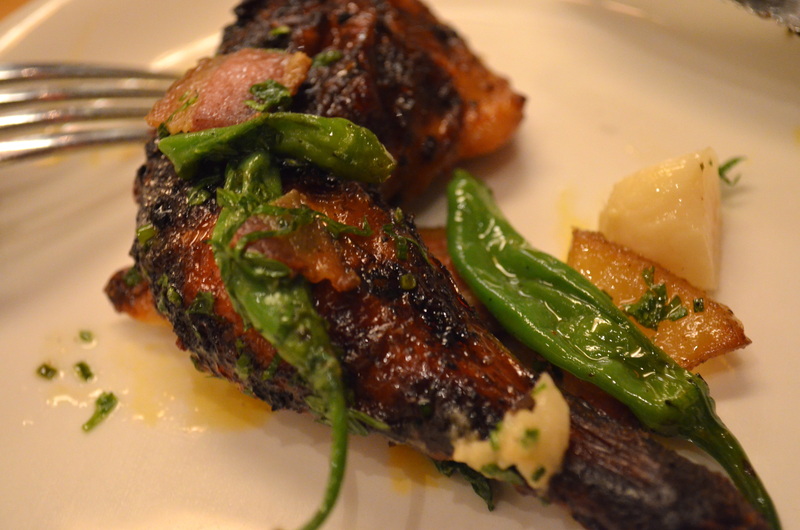 One of my favorite of the night, this dish had just the right amount of crisp, each tentacle blackened but not dried out. After these came the mains: (first) spaghetti al nero with house-cured cod, Meyer lemon, and bread crumbs; (second) roasted gnocchi with Pennsylvania mushrooms, (third) orecchiette with homemade sausage, green onion, and Parmesan, and (fourth) oven-roast chicken with mint, shishito peppers and roast garlic. Really, all these dishes were wholesomely delicious. 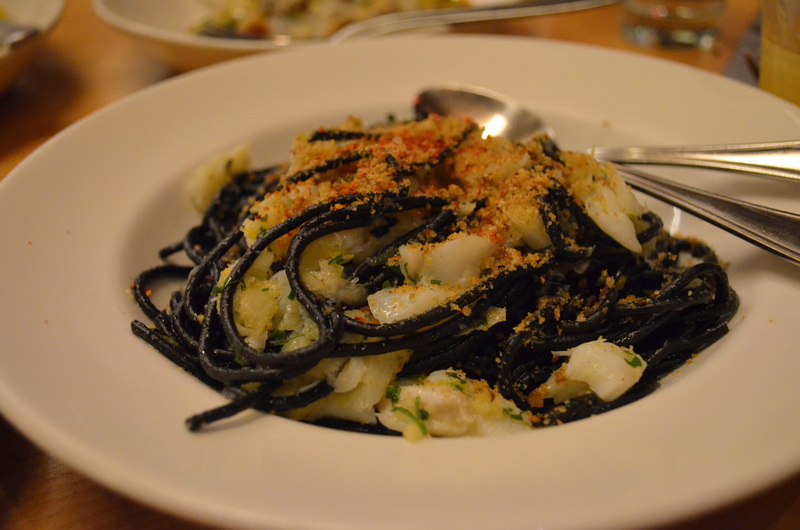 The spaghetti, perfectly al dente, had that slight bitterness from the black ink, the density of hard, oily pasta contrasted with the minute crunch of breadcrumbs and the flaky salt cod. 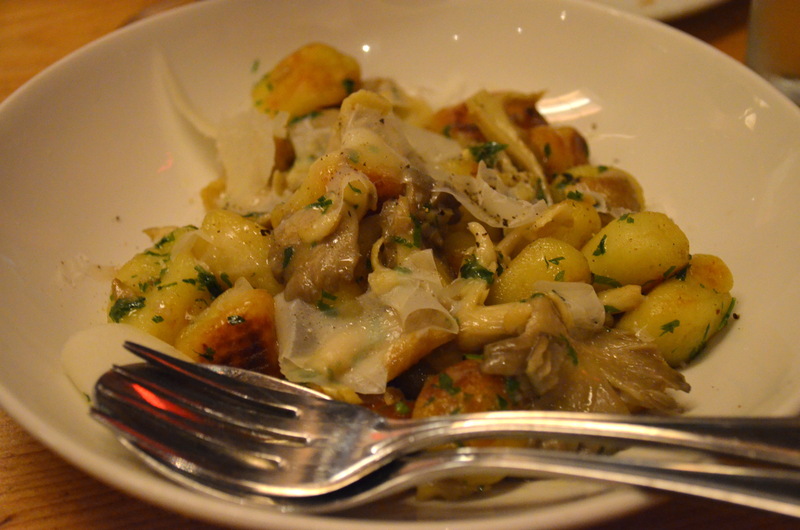 The gnocchi were hearty, combined with these meaty bites of mushroom. Il Buco’s housemade sausage had a great blend of pepper, sweetness, and lumpiness. 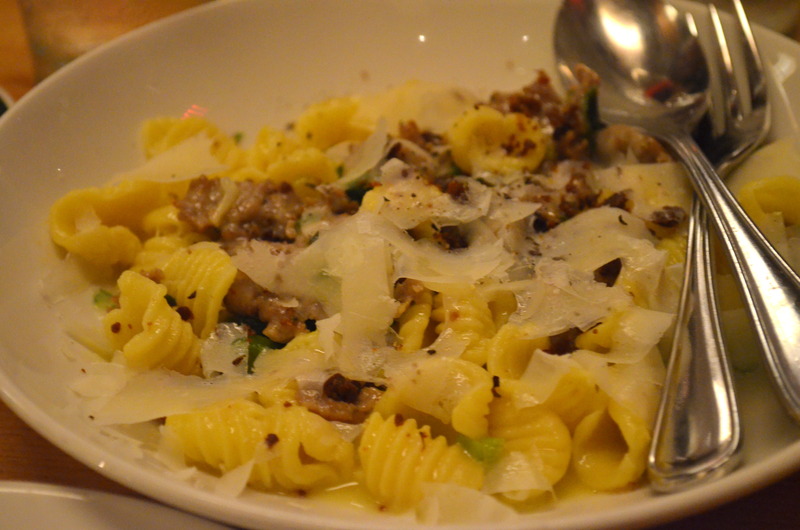 The doughy rounds of orecchiette were springy and nicely tossed in a cream sauce. And the chicken. Sweet baby Jesus, that chicken. How did that beautifully browned skin pack so much flavor? 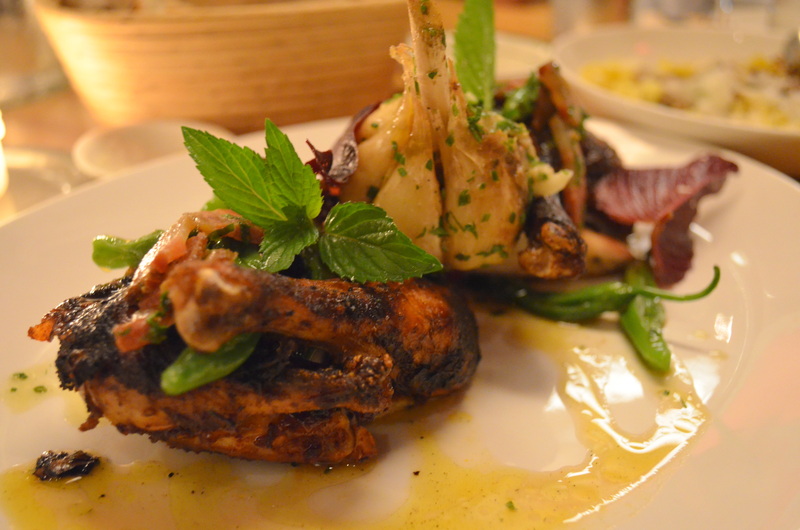 The shishito pepper was a great touch, a playful spiciness that complimented the creamy roast garlic.